Faster and Louder: Debut album from Shanda & the Howlers! Debut album from Shanda & the Howlers! Here we go with what ought to be THE summer album of 2017! 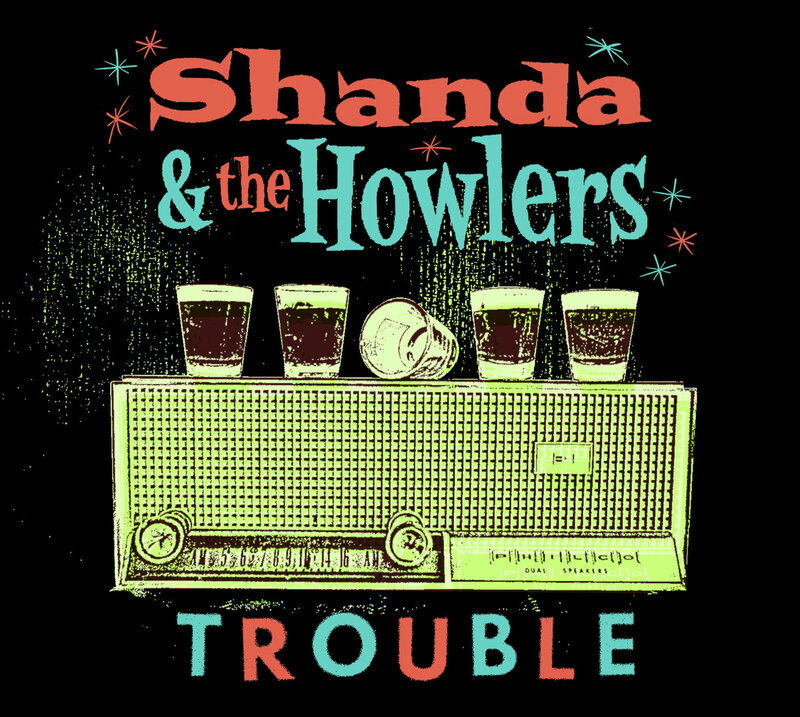 Shanda & the Howlers are a self-described rhythm & blues revivalist band. Perhaps that brings to mind cruise ship/wedding reception/tribute act shtick. Well forget that, because Shanda & the Howlers are the real deal! The band's debut album Trouble is out on the ever-dependable Rum Bar Records, and it's flat-out terrific from start to finish. What separates Shanda & the Howlers from the pack is that although they can certainly deliver crowd-pleasing covers in their live sets, their original material is every bit as good. Trouble sounds less like an homage to '50s/'60s soul and more like the genuine article. If Malibu Lou had told me he obtained the masters from vaults that were sealed 55 years ago, I would have had no reason to disbelieve him! No doubt the first thing you'll notice about Shanda & the Howlers is the remarkable voice of Shanda Cisneros. She's a dynamite lead singer and surefire future star. In a lesser band, her powerful pipes would completely steal the spotlight. But when you put her out in front of the Howlers, the marriage of voice and music could not be more perfect. This is how you do it, man: back a great singer with a super-tight band and just let it roll! If I didn't already know that Luke Metz was in The Heartdrops back in the day, I would seriously consider that he and Keith Alcantara might have time traveled from the '60s after laying down the rhythms for numerous Stax Records recordings. And Micah Lapping-Carr totally kills it on saxophone! As a huge fan of classic soul music, I'm always delighted to hear such a timeless style kept afloat by new bands writing original material. Trouble is an album steeped in a love not just for Stax/Motown soul but also the blues, jazz, and early rock n' roll that preceded it. By all means, this is music you can dance to all night long. But if you're more in the frame of mind to quietly ponder past heartbreaks and love gone bad, several of these songs will hit you hard. "Keep Telling Me" is an instant party starter, sounding like what might have happened if Etta James had sung lead for Ray Charles. And once the Howlers come on like Otis Redding's backing band on "She Don't Want A Man", there's no turning back. By the time you get to the chorus, the song's already stuck in your head and you just know you need to own the whole album. Covering everything from dance-floor shakers ("Don't Need Your Love") to bluesy rockers ("Don't Wait Up") to gritty R & B workouts ("Mind Made Up"), Trouble is consistently pleasing and never repetitive. And "Born With A Broken Heart" is simply stunning - proof that what really makes a great ballad is a vocal that you can truly feel deep down. As you may or may not know, Rum Bar Records had its origins under the name Melted Records back in the '90s. The Heartdrops were one of the first bands Lou worked with, and now we come full circle with Luke Metz's current band joining the Rum Bar family. 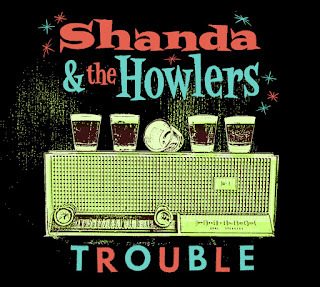 If label mates The Connection are making a good case that the best new rock n' roll ought to sound like old rock n' roll, Shanda & the Howlers are doing the same for soul music. This is one kind of trouble that you best not avoid! More Music to Fuel The Savage Spirit! The Best of the Dimestore Haloes! Great new EP from Gorilla*! It's here! The Motorgirl double 7"! Former head honcho at Now Wave Magazine, still writing about '77 style punk, power pop, garage/trash, and straight-up rock n' roll. I generally do not ask for review submissions. If you have something you'd like me to hear, please send digital submissions only. Due to life demands, I will be scaling the blog back to just a few reviews a month. I apologize in advance for being unable to review most of the submissions that are sent my way.